A 13-year-old boy was struck by lightning — at 13:13 hours on Friday the 13th, according to reports. The teen was watching an air show at Lowestoft, England, when he was struck and was later treated for burns to his shoulder, the U.K.'s Mirror newspaper said. He is expected to fully recover. Rex Clarke, leader of the St. John Ambulance team that treated the child, described what happened. 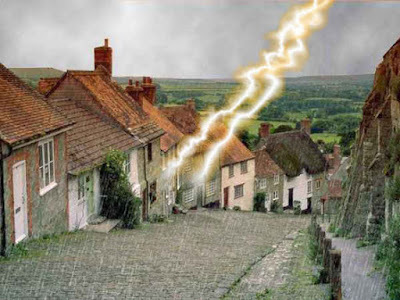 "Suddenly there was this huge crack of lightning really close to the seafront and really loud thunder," he told the Mirror. "Seconds later we got a call someone had been hit. The boy was breathing and was conscious." "He had a minor burn to his shoulder and was taken to hospital as a precaution. It could have been a lot worse," he said, adding: "It's all a bit strange that he was 13, and it happened at 13:13 on Friday the 13th." Two other spectators, who were standing near the boy when he was hit, were treated for minor injuries, the Mirror said.